I take no pleasure in being overly critical when it comes to the books I read, and so this is proving a difficult review to write. I started out with such high hopes, intrigued by the concept of a lesbian retelling of the classic fairytale of Cinderella. I’m also drawn to romances that err on the side of the forbidden, and the idea of stepsisters falling in love peaked my interest. Yet, despite its promise, I found The Second Sister a hard novel to get through, and my overwhelming feeling upon reaching the end was one of disappointment. This isn’t to say the story is all bad. I did find the writing style to have a pleasant flow, and Ellie’s emotions are well described, allowing the reader to experience everything along with her. I like the way Rae D. Magdon has included elements of the original tale—the heroine’s father remarrying before dying and leaving his daughter at the mercy of her stepsisters—but this is merely a starting point, a central thread the author weaves into her own narrative. There are some good secondary characters—better than the protagonists, in my opinion. I felt deeply for Cate, the servant girl who works alongside Ellie and who is forced to undergo horrific sexual abuse at the hands of the wicked stepsister, and it was wonderful to see her gradually emerge from her shell. I also loved Jessith, the haughty cat with an inflated opinion of herself, who immediately latches onto the animal-loving Ellie. In fact, being an animal lover myself, I preferred many of the non-human characters to the human ones. Sadly, however, I had too many niggles with this book to truly enjoy it. A major problem for me was that the reader is told so much and shown so little, particularly in the first half of the plot. I would have loved to become thoroughly immersed in Ellie’s life before everything went wrong, to have more interactions between her and her new step family, but it felt as though the author simply skimmed over this. As a result, I was unable to properly connect with the story or to feel a part of it. And now I come to my main issue with the novel—the romance between Ellie and her stepsister, Belladonna. I just wanted so much more from it, more time spent letting them get to know each other before they leapt into bed, more building of an emotional bond. While there’s plenty of physical attraction, meaning that I had little trouble believing the girls were in lust with one another, I got no sense whatsoever of this great love they claim to feel, and so the whole thing fell flat for me. 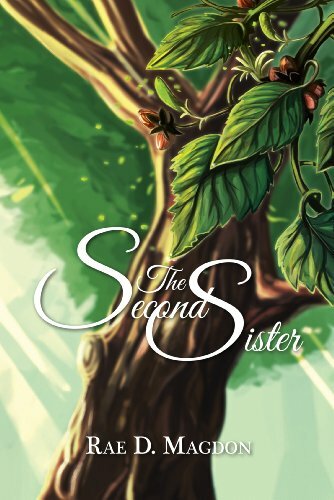 For an interesting premise, some relatable characters, and an easy-to-read style, The Second Sister by Rae D. Magdon gets 4/10 rainbows. Eleanor of Sandleford’s entire world is shaken when her father marries the mysterious, reclusive Lady Kingsclere to gain her noble title. Ripped away from the only home she has ever known, Ellie is forced to live at Baxstresse Manor with her two new stepsisters, Luciana and Belladonna. Luciana is sadistic, but Belladonna is the woman who truly haunts her. When her father dies and her new stepmother goes suddenly mad, Ellie is cheated out of her inheritance and forced to become a servant. With the help of a shy maid, a friendly cook, a talking cat, and her mysterious second stepsister, Ellie must stop Luciana from using an ancient sorcerer’s chain to bewitch the handsome Prince Brendan and take over the entire kingdom of Seria. Rae D. Magdon is a writer of queer and lesbian fiction. She believes everyone deserves to see themselves fall in love and become a hero: especially lesbians, bisexual women, trans women, and women of color. She has published over ten novels through Desert Palm Press, spanning a wide variety of genres, from Fantasy/Sci-Fi to Mysteries and Thrillers. She is the recipient of a 2016 Rainbow Award and a twice-nominated GCLA finalist. In addition to her novels and short stories, she writes for queer video games and a queer webseries. When she isn’t working on original projects, she spends her time writing fanfiction for Mass Effect, Legend of Korra, The 100, Wynonna Earp, and Overwatch. Previous Post Check Out a Teaser from Defensive Play, Coming November 30! Next Post Defensive Play (A Boys on the Brink Novella) – Preorder Now for Only $0.99!